Killer Characters: WHY DOESN’T THAT AUTHOR PICK ON SOMEONE ELSE FOR A CHANGE? WHY DOESN’T THAT AUTHOR PICK ON SOMEONE ELSE FOR A CHANGE? That Lois Winston! She’s done it to me again. Really, I don’t know what I ever did to her that she’s got it in for me. It was bad enough that in Assault With a Deadly Glue Gun, the first book in the Anastasia Pollack Crafting Mysteries, she nearly got me killed. Now she’s done it again. At first, I thought in this new book she’d changed her ways. I was living a nice middleclass life until she came along. Good job. Husband. Two kids. Nice house in the ‘burbs. She enters my life, and all of a sudden my husband turns out to be a closet gambler who’s decimated our bank accounts and racked up debt like you wouldn’t believe. And did I mention he’s got his own personal loan shark? Of course, I knew nothing about any of this until she had my dearly beloved drop dead onto a roulette wheel in Las Vegas when he was supposed to be at a sales meeting in Harrisburg, PA. I not only inherited all the debt, I also inherited Ricardo the loan shark. That was the first book in the series, and I’ve been dealing with the aftermath ever since. So when Lois opened Death By Killer Mop Doll with Mama announcing that she’d solved my financial problems, I thought, my author had seen the error of her ways and was making up for all the misery she’d inflicted on me in Assault With a Deadly Glue Gun. Boy, was I wrong! Let me tell you about the trouble she’s causing me this time. Then, before the glue is dry on my mop dolls, morning TV turns crime drama when the studio is trashed and a member of the production team is murdered. The former co-hosts, sleazy D-list celebrities, stand out among a lengthy lineup of suspects, all furious over the show's new format, but Lois makes me start snooping around, and the next thing I know, she lands me directly in the killer's unforgiving spotlight! I ask you, what did I ever do to deserve this? I don’t think my troubles will be ending any time soon, either. Lois has already turned in the third book in the series, and rumor has it that she’s been offered a contract for books 4 and 5. I hope I survive! Meanwhile, at least Lois is nice to her readers. 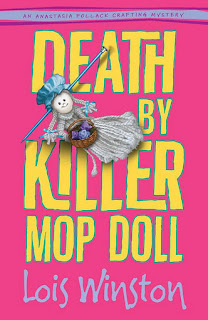 She’s on a blog tour right now and is giving away 5 signed copies of Death By Killer Mop Doll. All you have to do to enter is post a comment to this blog or any of the other blogs on the tour. But you’d better hurry. The tour ends tomorrow. You can find the tour schedule at her website and my Killer Crafts & Crafty Killers blog . She’s also giving away 3 additional copies on Goodreads. I hope you survive, too. Loved the first book, and can't wait to read this one :-) Good luck to you! I love this blog. I hope your survive the books too. Thanks to Lois for the chance to win this book, it sounds good. Maybe these authors should get a life! What's that you say? Oh. Sounds like a whole lot of fun, actually! Good luck! I enjoy hearing from characters. And I think it's good therapy for you, Lois, to listen to Anastasia. She make take you to some wonderful places you've never imagined! We have our lives and the lives of our characters and . . . I want to hear more about those mother vs mother-in-law battles----they should really spice up the book!! LOL, Sue! You can read all about them in the book. Elizabeth, Anastasia is never happy with me. Glad we could make you smile, though. What a cute commentary from Anastasia. I hope the two of you kiss and make up! Hmm...not sure that will ever happen, Jane. Anastasia is known to hold a grudge. Can't say that I blame her, though, given what her dead louse of a spouse put her through. Too funny. I can't wait to see what you've in store for poor Anastasia in #'s 3 and up. P.S. 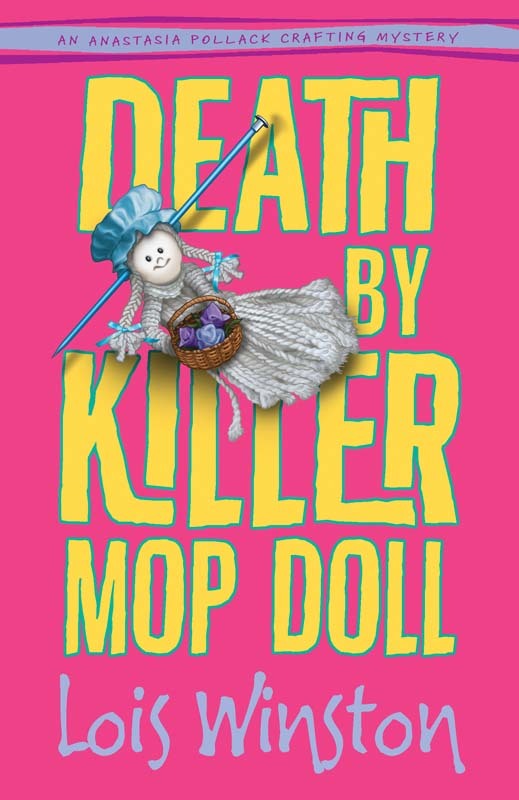 Don't bother entering me in the contest, I've already read Killer Mop Doll and loved it. Thanks, Cris! So glad you enjoyed the book!